There have been three attempts to re-organize the merged Board of Elections and Ethics Enforcement and three lawsuits over those efforts. Executive Director – The Board shall appoint an Executive Director in May 2019 to a two-year term. Until then, the Executive Director as of December 2016 (Kim Westbrook Strach, who was appointed by former Gov. Pat McCrory) will occupy this role. Four Republicans – The Governor appoints these members from a list of six nominees selected and provided by the state chairs of the Republican Party. Four Democrats – The Governor appoints these members from a list of six nominees selected and provided by the state chairs of the Democratic Party. One Unaffiliated – The Governor appoints this member from a list of two nominees selected and provided by the above eight members of the Board. *The Governor has the ability to fire Board members at will. Members serve two-year terms beginning May 1 of the odd-numbered year. **This structure is set to become law Friday, but litigation is pending after Cooper filed a lawsuit and temporary restraining order Tuesday. 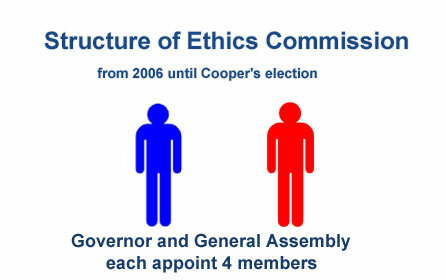 *The Governor has the ability to fire Board members only for misfeasance, malfeasance or nonfeasance. Members serve two-year terms beginning May 1 of the odd-numbered year. Executive Director – The Board shall appoint an Executive Director to a four-year term. Until the Board is appointed in 2017, the Executive Director as of December 2016 (Kim Westbrook Strach, who was appointed under the former GOP Gov. Pat McCrory administration) will occupy this role. Four Republicans – The Governor appoints two of these members from a list of three nominees selected and provided by the state chairs of the Republican Party. The General Assembly appoints two members – one based on a recommendation from the Speaker of the House (who chooses from a list of six nominees – three selected and provided by the House majority leader and three selected and provided by the House minority leader) and one based on a recommendation from the Senate President Pro Tem (who chooses from a list of six nominees – three selected and provided by the Senate majority leader and three selected and provided by the Senate minority leader). Four Democrats – The Governor appoints two of these members from a list of three nominees selected and provided by the state chairs of the Democratic Party. 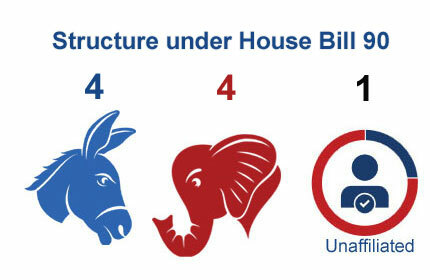 The General Assembly appoints two members – one based on a recommendation from the Speaker of the House (who chooses from a list of six nominees – three selected and provided by the House majority leader and three selected and provided by the House minority leader) and one based on a recommendation from the Senate President Pro Tem (who chooses from a list of six nominees – three selected and provided by the Senate majority leader and three selected and provided by the Senate minority leader). *The appointing authority has the ability to fire Board members only for misfeasance, malfeasance or nonfeasance. Members serve four-year terms beginning May 1 immediately following the election of the Governor. 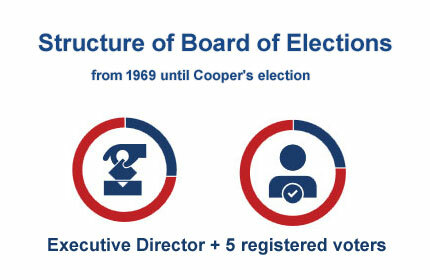 Executive Director – The Board shall appoint an Executive Director on May 15, 1989, to a four-year term. Five registered voters – The Governor appoints members to four-year terms from a list of 10 nominees – five selected and provided by the Democratic Party and five from the Republican Party. No more than three members may be from the same political party. Eight members – The Governor appoints four members and the General Assembly appoints four members (two upon the recommendation of the Speaker of the House and two upon the recommendation of the Senate President Pro Tem). 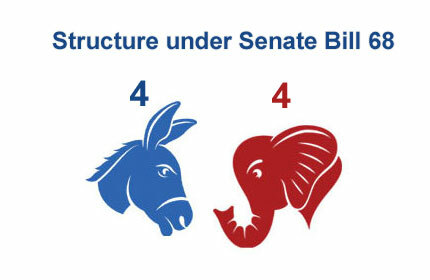 No more than two of each set of appointees may be from the same political party. * The appointing authority has the ability to fire Board members only for misfeasance, malfeasance or nonfeasance. The commission may employ an Executive Director.